See beautiful Buffalo from a bird’s eye view—this helicopter tour circles the busy city, swooping over its many landmarks with the doors off! See beautiful Buffalo from a bird’s eye view—this helicopter tour circles the busy city, swooping over its many landmarks with the doors off! 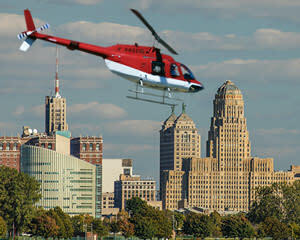 Yup, you heard right—no doors on this Buffalo helicopter tour! With a camera in hand and nothing obstructing your view, you’ll be snapping the most striking photos from this privileged vantage point! For 20 minutes, you’ll cover lots of air. You’ll travel from the Outer Harbor to downtown, the Theater District and more! Enjoy striking architectural landmarks such as Buffalo City Hall (with its art deco design) and the federal courthouse! Get acquainted with your pilot and harness in for the helicopter tour! Soar over Buffalo for 20 minutes with the doors off! Glide high above the Theater District. We tend to talk a lot about the views when it comes to these types of tours but another sensory standout worth highlighting is the physical sensation of flying with the doors off. Feeling the open sky against your face is as stimulating as the unforgettable eye-candy below! Book this adventure now!